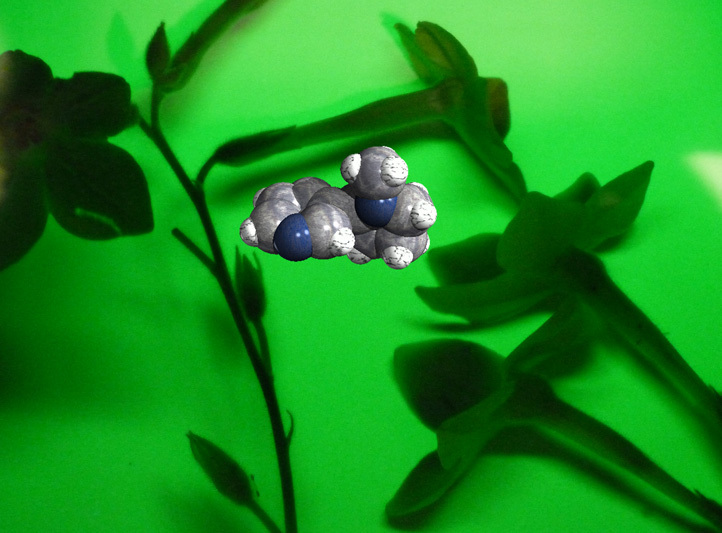 Flowers of Nicotiana alata ‘Lime Green’, a relative of the tobacco plant Nicotiana tabacum, together with the molecular structure of (S)-nicotine, captured under UV light. Originally grown in the Americas and brought to Europe by intrepid explorers in the 16th century, tobacco has been smoked for thousands of years. Even today, despite well-known and documented health risks, over 6 trillion cigarettes are produced globally each year by over 500 separate cigarette factories. 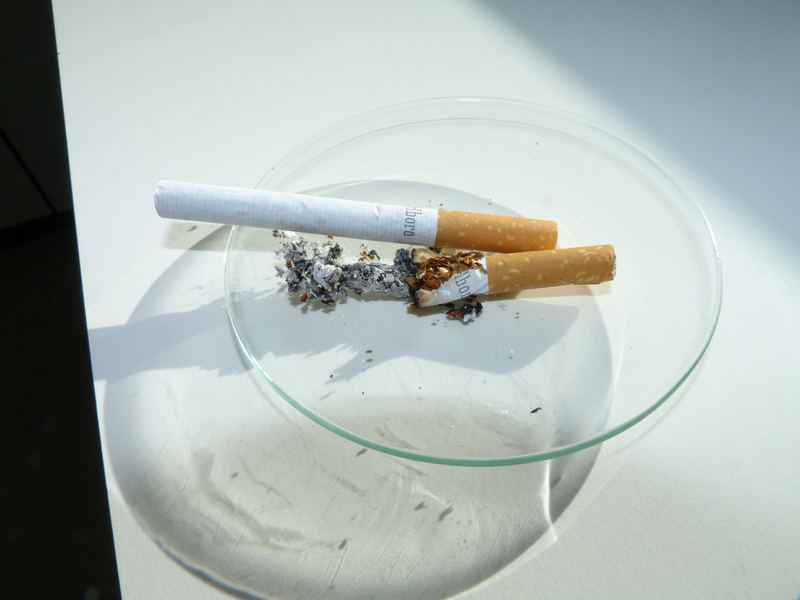 So what are the key chemicals in cigarettes and why is it so hard to quit smoking? 1) The photo above is of Nicotiana alata ‘Lime Green’, captured under a UV lamp. This plant is a relative of the tobacco plant, Nicotiana tabacum, and the structure of nicotine is also shown in the image. Aside from making things look pretty, UV spectroscopy has many uses in chemistry. It is used in analytical chemistry to help determine molecular structures and some chemical reactions proceed only when exposed to a certain wavelength of UV radiation. The UV lamp here is usually used to visualise thin-layer chromatography (TLC) plates. This type of chromatography can be used to analyse mixtures and monitor the progress of chemical reactions. Different compounds travel at different speeds on these plates when a solvent is allowed to move up, allowing their separation. The TLC plates are often coated with a fluorescent material, so under UV light they glow, whereas other compounds show up as darker spots, making it easier to observe them. More information can be found in a variety of web resources for Chemistry, for example ChemWiki. Nicotiana tabacum is a member of the Solanaceae family of plants. This family contains a wide variety of plants, some of which are poisonous, whereas others are familiar and popular food, such as potatoes, tomatoes and chillis. Others are perhaps less well known, such as the ‘Deadly Nightshade’, Atropa belladonna. As the name suggests, ‘Deadly Nightshade’ is one of the most toxic plants in the Eastern Hemisphere, and is found in Europe and parts of Africa and Asia. The consumption of just five nightshade berries is lethal to a grown man. There are over 70 species of tobacco plants, of which the main commercial species is Nicotiana tabacum. This plant is believed to originate in tropical America, but has been grown agriculturally for so many generations that it no longer grows in the wild, with Turkey, India and Russia now the main modern tobacco-producing countries. Many ancient cultures, such as the Babylonians and the Mayans, smoked tobacco, for example to conclude a sacred ceremony or to cure earache. It was first popularised in Western Europe in the 16th Century, when diplomat Jean Nicot de Villemain sent tobacco seeds from Brazil to Paris. 2) Nicotine is a stimulant drug, which is a substance that raises the level of physiological and nervous activity in the body. Nicotine and caffeine cause similar physiological effects such as alertness, wakefulness and motivation. Recently, doctors have been experimenting with nicotine to help decrease the rate at which dementia patients lose their memory, with positive results. Figure 1. The structure of (S)-nicotine, showing the bicyclic ring structure. The pyridine ring is shown in blue, and the pyrrolidine ring is shown in red. Nicotine, or 3-(1-methyl-2-pyrrolidinyl)pyridine (Fig. 1), is a simple bicyclic molecule. 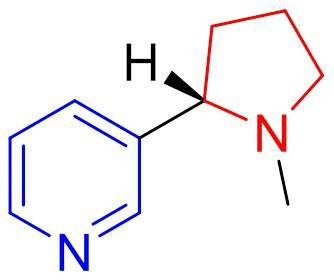 The term bicyclic means it contains two ring structures (in the case of nicotine a pyridine ring and a pyrrolidine ring, as shown in blue and red respectively (Fig. 1)). Nicotine is an alkaloid, which means it is a naturally occurring molecule consisting of only nitrogen, carbon and hydrogen. The molecule possesses an asymmetric carbon centre, i.e. a carbon which has four different groups attached to it, which can be arranged in two different ways. The two different structures which arise from the arrangements are called enantiomers (the concept of chirality was also described in a previous post). Nicotine has two enantiomers, shown in Figure 2, but only one of these, the (S)-enantiomer, occurs naturally in tobacco plants. This is known as enantioselectivity, and is common to molecules found in nature, as a molecule’s chirality is vital in determining how it interacts with other (chiral) molecules and receptors in the plant. Figure 2. The structures of (S)- and (R)-nicotine. The chiral carbon is highlighted by the red asterisk. In (S)-nicotine, the hydrogen on this carbon is pointing towards us, whereas in (R)-nicotine it is pointing away from us. These two structures are non-superimposable mirror images and thus different from each other in a chiral environment. Nicotine is, in fact, very similar chemically to many illegal stimulants, such as amphetamine, methamphetamine and MDMA (3,4-methlyenedioxy-N-methylamphetamine), the structures of which are shown in Figure 3. Instead of a pyridine ring, these stimulant molecules have a benzene ring, and instead of a cyclic amine they have a variation of secondary or primary amines (i.e. a nitrogen atom bonded to one or two hydrogen atoms, respectively). Interestingly, the chirality of some of these molecules can make a dramatic difference to their pharmacological effects, for example (S)-methamphetamine is illegal, whereas (R)-methamphetamine can be occasionally found in decongestant medicines. The (S)– enantiomer of MDMA is thought to have a greater effect on the body than the (R)-form, although they are both illegal, whereas amphetamine is taken as a racemate (meaning that equal amounts of both enantiomers are taken). 3) The biosynthesis of nicotine in Nicotiana plants involves the separate formations of the pyridine and pyrrolidine rings, followed by a coupling reaction to form the final nicotine structure, however, synthesising nicotine enantioselectively has proven to be slightly trickier. In 1904 the first (non-enantioselective) laboratory synthesis of nicotine was reported, although this was later refined and improved on as many unwanted side-products were also made (Ber. Dtsch. Chem. Ges., 1994, 37, 1225–1235). 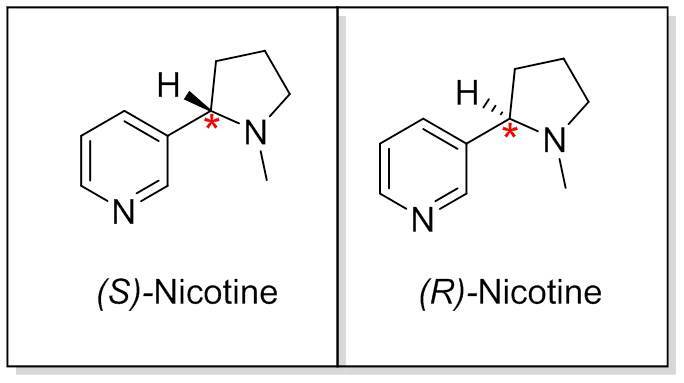 Some years later, a racemic mixture of (S)- and (R)-nicotine was synthesised by Craig et al., which proved useful in investigating the biological effects of the different enantiomers (J. Am. Chem. Soc. 1933, 5, 2854–2857). In 1976, Widby and Seeman reported that, experimentally, the enantiomer which is preferred is the (R)-enantiomer (J. Org. Chem. 1976, 41, 1585-1590). The first reported synthesis of (S)-nicotine was in 1982 by Chadvdarian et al., who used a chiral starting material (L-proline) as a building block to synthesis the rest of the molecule around (J. Org. Chem. 1982, 47, 1069-1073). However, the enantiomeric excess achieved by this route was only 24%, and this was improved on in later syntheses. Figure 4 shows an enantioselective reaction of (S)-nicotine by Loh et al., published in 1999 (Tetrahedron Lett. 1999, 40, 7847–7850). This involves a lithium-halogen exchange followed by reaction with a lactone in the first step, followed by a Swern oxidation to give an aldehyde. Two further steps involve the use of 2,3,4,6-tetra-O-pivaloyl-b-D-galactopyranosylamine as a chiral auxiliary and lead to the eventual synthesis of (S)-nicotine with an enantiomeric excess of 98%. This synthesis is shown in Figure 4. Figure 4. 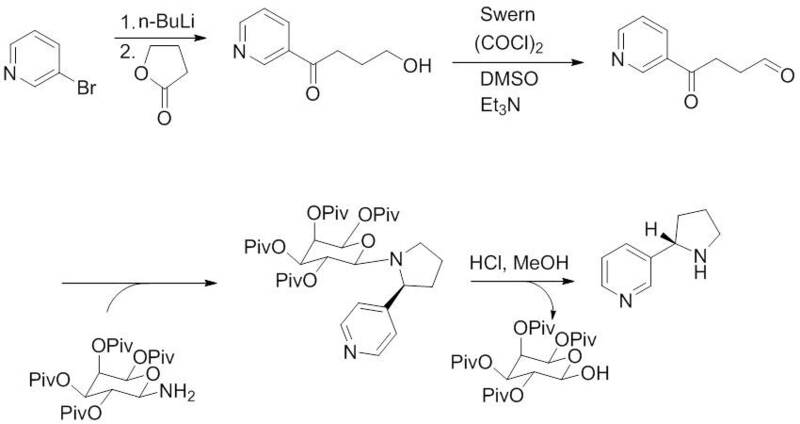 Enantioselective (S)-nicotine synthesis first reported by Loh et al. in 1999, which uses a chiral auxiliary to ensure a high enantiomeric excess. For those interested in reading more on this topic, a recent review (Tetrahedron, 2007, 63, 8065–8082) summarises some of the developments in this field. 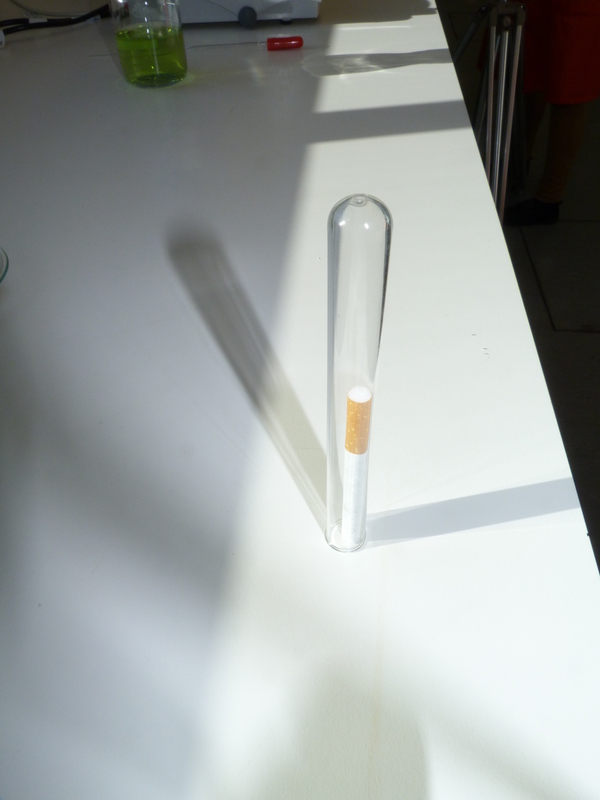 Nicotine is one of thousands of compounds which are inhaled while smoking, many of which are harmful. Though nicotine is not itself carcinogenic or particularly toxic, it is perhaps the most well-known of these compounds due to its highly addictive properties, and it is what makes it difficult to give up smoking. Contributors: Emma Kastrisianaki-Guyton (research, words and editing), George Connell (research, ideas and words), Alex Henderson (ideas), Jenny Slaughter (photography and editing), Natalie Fey (molecular structures and editing). Categories: Biochemistry, Chirality, Plants, Poison, Synthesis | Tags: biochemistry, chemistry, chirality, medicine, nicotiana, nicotine, pharmaceutical, science | Permalink.